President Trump signed his first presidential veto on Friday in the Oval office. Several Border Angel parents joined President Trump during the signing to kill the congressional bill blocking the president’s emergency declaration. Despite the tens of thousands of illegal aliens crossing into America each month, the tons of illegal narcotics and strain on the US economy Democrats and 12 turncoat Republicans voted to kill the president’s emergency declaration. On Friday Attorney General Bill Barr sided with President Trump. Barr said the president “absolutely has the right to declare a national emergency on the southern border there. He says the veto is the right thing to do. And the declaration will hold up in a court of law. 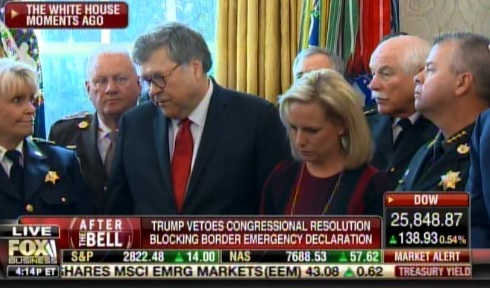 AG Bill Barr: Mr. President your declaration of an emergency on the southern border was clearly authorized under the law and consistent with past precedent… The humanitarian and security crisis that we currently have right now on the border is exactly the type of emergency that presidents are permitted to address.